We are already into our 3rd week since the wedding and are still dealing with the backlog of work that built up in those last few weeks before what was a fantastic day for basically the whole world, not only us! 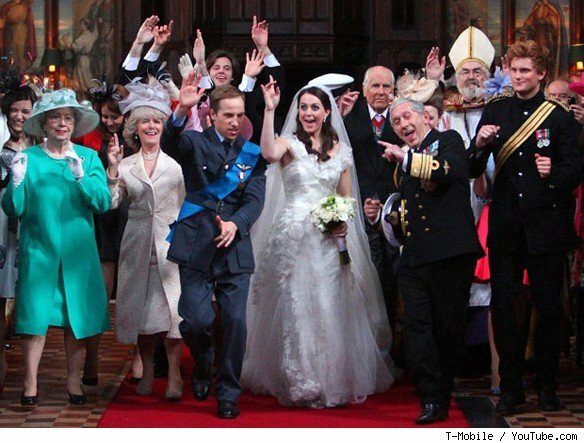 Kate and William’s’ wedding is over and was the culmination of the busiest 5 months I have ever had! It was so unexpected no other event, since I started lookalikes at the end of the 70’s, has come anywhere near it! Why should this have happened, especially as we are still struggling to come out of the Recession? The answer is that our work was completely media based – starting with the engagement in November and finishing as they walked down the aisle. It was all so exciting for Helena and me here in the office and more exhausting than we could ever have imagined. By the end we were almost working 24hrs around the clock with requests coming in, particularly from the US through the night. This included CNN, CBS, ABC, NBC, CBC (Canada) Channels 9, 10, and 7, Oz, NZTV, Proseiben, Maz, M6, appearances for us or the lookalikes on Entertainment tonight, Inside Edition, Good Morning America; interviewed by Amanda Holden, Dame Edna Everidge, Sharon Osborne and Jane Seymour. We had steady stream of TV crews visiting our office daily throughout April. We appeared on BBC news twice – including a clip on a Saturday morning which must have been the best exposure ever. Added to this, I had interviews on so many radio stations – I lost count – 5Live, ,Coventry,Oxford, Hayes,Peterborough… which I always a bit weird as Lookalikes are such a ‘visual’ thing. 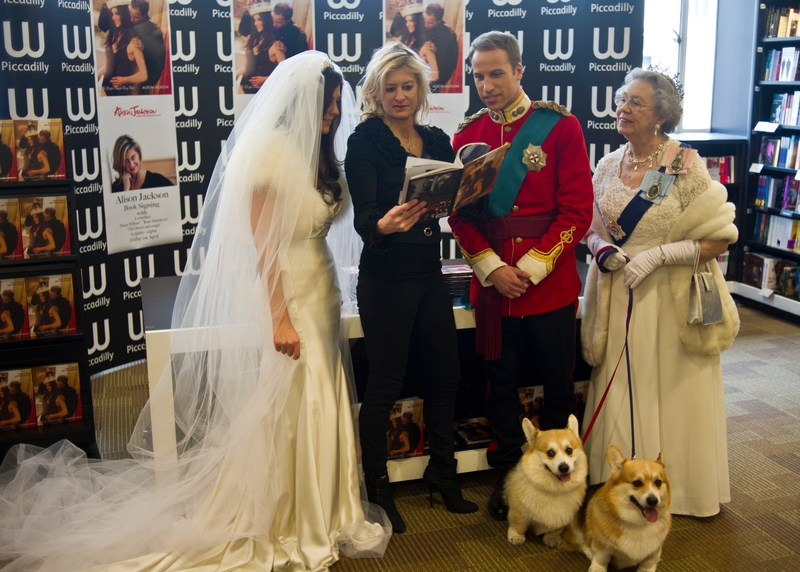 Alongside the media hype we were completely involved in the shooting of Alison Jackson’s new book ‘Up the Aisle’ which was devoted exclusively to the wedding in her own ‘particular’ style. It was all shot and the book published before the wedding but somehow she managed to dress her William, Simon W, in the red Irish guards uniform even though we all believed he would wear RAF uniform. Well done Alison – luck or inside information I wonder. She launched her book on April Fools Day with Mary R (The Queen), Jodie B (Kate) and Simon W (William) driving through London to Waterstone’s in an open, horse-driven carriage almost causing riots and was in fact evicted from the mock wedding she set up in St. Pauls Covent Garden – amazing scenes which also made the BBC News. But the icing on the cake, on top of everything we did, was the wonderful T-Mobile viral wedding dance. Where the whole Royal family (all 13 from us – Yes!) danced down the aisle of Bart’s (Smithfield) Church to the music of E17’S House of Love. It was put together in a couple of weeks by Saatchi and Saatchi and Gorgeous and directed by Chris Palmer, the lookalikes had 3 rehearsals – the first of which I attended where the choreographer almost wiped out half the cast over 50, if not 70, with his over vigorous routines, which was pretty worrying for us all. But it was obviously a test as to see what each person was capable of and by the actual shoot had been pared down to suit their particular abilities. It was aired on YouTube on April 15th and now has 21, 417, 595 hits! One of the biggest jobs we have ever done and definitely the most exciting. The logistics were difficult with the artists coming from all over the place and with 2 rehearsals prior to the actual shoot, Jane Mosse (Camilla) Guernsey, Anne D (Princess Anne) and Hannah J (Princess Beatrice) Cheshire, Vernon (Prince Phillip) Dorset, Jodie (Kate) far reaches of Essex etc. the list goes on. What a nightmare to organise not just in retrospect but at the actual time of the shoot. On top of all this it was my mother-in law Annie’s 90th Birthday Party, which we had here at home for 40 odd people! But a time never to be forgotten or bettered – I would reckon.